-- A Cardassian warship that was taken by the Caretaker in 2371. It was later returned to the Alpha Quadrant where it was destroyed by the Maquis. -- The destruction of the Caretaker allowed a rip to form in subspace that possibly allowed a tractor beam from a cloaked ship to save the secondary reactor. -- A number of alliances forged during Voyager's time in the Delta Quadrant, with species such as the Borg, the Hirogen, the Terkellians, and the Kolhari. -- Seska getting pregnant with Chakotay's child, which was in actuality that of First Maje Jal Culluh of the Kazon-Nistrim, in 2372 is used as evidence against him. (VOY: "Maneuvers", "Basics, Part II") Seven refers to her as "Commander Seska", when, in fact, Seska never held a rank above ensign. It is unclear whether this was a true continuity error, or part of Seven's misinformation. 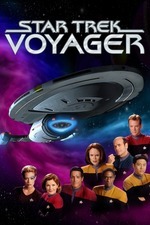 - While Janeway debunks Seven’s conspiracy theories, the mysteries of why Voyager was armed with tricobalt devices and where the apparent tractor beam aimed at the Caretaker’s array originated from remain unsolved by the end of the episode. "Can we ask you what it's supposed to do?" "Catapult a vessel across space in the time it takes to say 'Catapult a vessel across space'." "A secret mission? Starfleet in league with the Caretaker? It's ridiculous!" "Ridiculous? Seven has some compelling evidence." "Well then let's go to the captain, get a straight answer." "'Good morning Kathryn. All systems operational, the crew's in good health, and by the way, is it true you've been lying to us for five years?'" A good episode, one that was unexpectedly funny in certain bits and works on more than one level. Again, Memory Alpha doesn't have a lot to say about it, which is too bad, because one of the subtexts of the story is about fan theories of all different kinds, both about the Trek universe and about behind-the-scenes inside-baseball stuff. (Ironically, one of the legitimate inside-baseball aspects of the show--Kate Mulgrew's feud with Jeri Ryan--isn't apparent here as they have some good scenes together.) It even plays off the apparent inconsistencies in the show, such as tricobalt devices only being seen in the pilot, as somehow being significant. Ryan scales up Seven's mania as her theory evolves to first implicate Starfleet, then the Maquis, then to be all about her. (For a moment, it even ropes in Naomi Wildman.) The episode even acknowledges that Seska and Kes existed, which is progress. Poster's Log, supplemental: The craziest Trekkie theories. Poster's Log, supplemental, Mass Effect edition: The first three games make use of "mass relays", which work pretty much the way that Tash's catapult does; they can move starships across the galaxy in a matter of seconds. (Pluto's moon Charon is one of these, albeit encased in a globe of ice.) And the mother of all fan theories may be the Indoctrination Theory, which posits that inconsistencies in the games and the unsatisfactory ending of the third game may be the result of Commander Shepard being "indoctrinated" (a form of permanent coercion) by the game's main villains, the Reapers. Throughout all of the dialogue in Seven's hypotheses, and in Janeway's confrontation with her about them, I kept expecting them to say, "READ THE BOOK!" Um… but the Borg were introduced years after TMP. Here's my conspiracy theory: whoever wrote this article wasn't a Trekkie, was given a list of facts without context, and just stitched 'em together. Incompetence? Or the vanguard for a deliberate misinformation campaign? I love this episode. It's a favorite just for the continuity review. What bugs me still (and I mentioned this on here a long time ago; can't find the episode page right now) is that once again the show raises the question of why Voyager was carrying tricobalt warheads and then it dismisses the issue one more time without answering it. Why did Voyager have these special weapons? Moreover, speaking of unanswered questions, what was going on with that tear in subspace? Was the catapult's tetryon reactor originally from the Caretaker's array? once again the show raises the question of why Voyager was carrying tricobalt warheads and then it dismisses the issue one more time without answering it. The simplest explanation is also the most conspiratorial: Starfleet liked how Sisko handled the Maquis when he poisoned those planets, so they figured, let's kick it up a notch. And DS9: "Blaze of Glory" establishes that the Maquis got their hands on some tricobalt explosives, so the red line had been crossed in that regard. What if Voyager's secret mission, unknown to probably anybody on the ship, was going to be the extermination of the Maquis?!?! READ THE BOOK. I love this episode. It's a favorite just for the continuity review. I mean, yeah, that's fun and all, but after enough rewatches and beanplating, the continuity review itself leaves a bit of a disagreeable flavor in my mouth. Like, it's calling attention to the series' haphazardness w/r/t continuity. YMMV. Particle of the Week: Definitely tetryons. Amber spice gets a mention in Reunion, where Neelix implies it's hot (and so probably past anything a human would generally eat, given Neelix's palate). Seven's theory about Starfleet seeking military alliances in the Delta Quadrant will also later occur in Alliances, in contravention of the treaty Chakotay mentions here. It's been 30 years though, and both the Klingons and the Romulans have had significant political changes in the interim - the much more famous Treaty of Algeron is also dropped somewhere in STO's timeframe, allowing for cloaked Starfleet vessels. Also, tricobalt devices in STO can canonically create tears in subspace when set to high yield because of this episode. Finally, the device that slings them 1000 LY looks a lot like the transwarp gates available as a fleet base upgrade for player run organizations. * Credulity Straining Alpha Quadrant Contacts: Still 13, but the entire episode is about credulity straining incidents. * This starts strong and ends weak. So the setup's plausible and well-handled, including Seven's ongoing friendship with Naomi Wildman. I also broadly buy the idea of super-intuition. What Seven is doing here reminds me of nothing so much as Limitless, which is one of my favorite movie takes on 'person is abruptly super-smart.' I also actually organized my own academic life around the idea of synergy between disparate ideas/fields, back in the day (based loosely on the guy in Isaac Asimov's Sucker Bait), and what Seven is doing here seems like a cybernetically enhanced version of that. And I like the alien of the week. He strikes the right balance of nervous but well-intentioned. So... good setup. The thing with the photonic fleas was cool, too. I started to waver when she began citing the show's plot holes for her continued theorizing. Personally, I don't think that's good practice to lampshade stuff like that most of the time - just reminds fans that 'hey this detail didn't make sense in the first place.' Adding weirdness like 'was there a tractor beam?' feels... dunno. I just don't see that as a good thing for a show already riddled with inconsistency. after enough rewatches and beanplating, the continuity review itself leaves a bit of a disagreeable flavor in my mouth. Like, it's calling attention to the series' haphazardness w/r/t continuity. YMMV. The trick is to not think about it too much just like the writers did not either. I can explain it. The Dominion wasn't running a valet parking service there. They're lucky they didn't get a parking ticket from a Vorta meter maid.